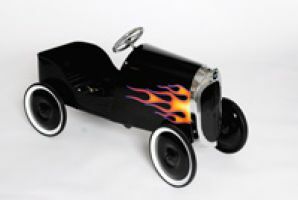 The 34 Classic Hot Rod Pedal Car with Flames is an impressive toy sure to delight children. The "hot" flames and attention to minute hot rod detail is evident in the many features and will keep kids focused and entertained for hours. While adult supervision is required, this toy is Safety Tested and Approved. Ages 3-7.